This week we will answer some crazy questions brought to you by Berleen, the color puke green and the number 12345. 1. You are walking down the road and you look down. There is a bug. Do you step on it? Of course not! Bugs, even those loathsome raoches, are creatures too. They are a part of the circle of life. 2. What is one fantasy that you want to come true more than any other? Aside from being debt-free, it would be to travel around the Philippines' 1,107 islands in thirty days. 3. Someone knocks on your door. Do you look out the window to see who it is before you open it? Do you open it regardless of who it is? I always take precautions and look out the peephole each time someone knocks or rings. These days, you never know who to trust... As the line from the movie Italian Job goes: I trust everybody. It's the devil in them I don't trust. 4. 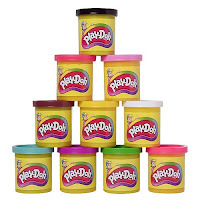 Have you ever eaten Play Doh? 5. What was your favorite Saturday morning cartoon as a child and why? I've always watched out for Cedie... the little Prince who is so innocent and kind that he was able to melt the heart of the hardest and coldest person: his grandpa. I even cry my heart out for some of the scenes! Lol! 6. Are you a "people watcher"? I guess so... My hubby would always scold me that I am "at it" again. I have the tendency to not only watch people but "stare" at them. 7. I have a bowl of fruit. There are apples, oranges & pears. You help yourself to one - which one do you choose? Apples. No need to peel or slice. Just take a bite and you're good to go. 8. What is your biggest pet peeve in the blogging world? Spammers and rude anonymous commentators. Haven't they got anything else to do? 9. What is one religion that you could just never see yourself joining? That would be Satanism. I am against anti-Christs. Period. 10. What word do you use far too often? "Sorry." It slips out of my tongue way too many times. And I do mean it! 11. 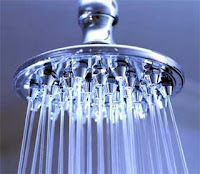 How long do you spend in the shower? These days, 15 minutes tops. I sometimes treat myself to a long shower and a soak in the tub from time to time though. 12. If you were to write a personal ad about yourself, what would it say? "A mass of wild contradictions. Proceed with caution." 13. Your favorite flavor of soup is....? Corn soup. Plain and simple. 14. You are sitting on a bench in the park and a bug walks in front of your feet.... do you squash him? No. I don't like squashing bugs. Either I look at it or I run away. For more interesting answers and to join this Thursday meme, click here. LOL I like your personal ad. I use the word “sorry” just about as much as I use “like”! corn soup? Interesting answer! Never heard of it. Love the personal ad - My husband says I stare too - so I bought new sunglasses!